A successful indoor rowing class, personal training session, workout or WOD depends on having the right equipment in the right condition. That combined with the right technique and the right attitude (Hint: Smile!). Check here often for tips from Concept 2’s master instructors that will help you give and get your best workout on the rowing machine, SkiErg or BikeErg. Music in your classes shouldn’t be so loud that you can’t hear the instructor unless you’re doing a steady-state piece. This is especially important in classes comprised primarily of indoor rowers who don’t have on-water experience and therefore aren’t as familiar with the rowing machine or the cadence and technique of the rowing stroke. A moderate music pace is best to accompany indoor rowing, so keep your beats per minute around 120. Instrumental music like that used for Spinning (try PMax or Rowing2Music for rowing-specific music and workouts) can help people focus on the class. If you need to get the group revved up though, familiar hits can quickly pick up the mood of a low-energy room. Keep in mind your class’s age and musical tastes when you make your selections. Particularly if you’re going to be getting off your erg a lot or your rowing students can’t see you well (for instance if your room doesn’t have mirrors), make sure your music has a clear rhythm that students can follow when you’re not able to guide them. Make sure your students remember the 1:2 drive to recovery ratio. Even in short, fast pieces such as those used in CrossFit workouts it’s important to give the body a chance to recover before the hard push of the drive. c) It will help the student not rush the slide, a common mistake among people who overcompress. Beginning rowers should resist the temptation to row for 30 minutes or more their first time out on the machine. Have them start with no more than 3-5 minutes at a time, then take a break to stretch and walk around. If they feel good they can do up to four of these short rowing intervals. If you row with seniors or others who have challenges with their mobility, consider putting a stable chair (meaning not a folding one) next to the erg so they have something to grab onto to help them get on and off the rowing machine. Rubber door stops stuck into the front and back of the seat also make an excellent brake to stop the seat from sliding while people are getting on and off. If you have rowers who drop their hands as they come into the catch, have them pull the handle straight back to the finish and place a piece of colored tape on the chain guard to mark the correct chain height. alternatively, put a water bottle at the latch in between the foot flexors. If the rower knocks over the bottle, the chain is too low. Check your damper setting when you get on the rowing machine and make sure it’s where you want it. The recommended range for the damper is 1 to 5 on the rowing machine. If the monitor on your rowing machine or SkiErg is turning off quickly the batteries may be running low. Check them by going from the main menu into More Options>Utilities>Battery. If the monitor goes off before you can record your meters you can always check them under More Options>Memory. Want to brush up on your indoor rowing technique? Bookmark and watch the Concept2 indoor rowing technique video. And don’t forget the How to Row feature on the monitor, which can be found from the main menu under Information. Use the target game on the monitor to help develop your stroke consistency. From the main menu go to Games and select Target Training. How many times in a row can you hit the target? If you’re thinking about training for a competitive sprint like a 2,000 meter indoor rowing competition, be sure that you can first comfortably row at least 10,000 meters so you’re prepared for the effort you’ll put into the 2k rowing training. Indoor rowing and skiing tax your posterior muscle groups most (shoulders, lats). Remember to balance that work with push-ups (modified as-needed to meet your fitness level) and stretching of the back, chest and shoulders. 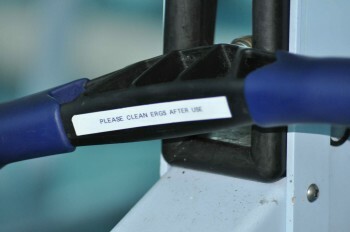 If you’re new to the erg, your first week of rowing should be rows of 15-30 minutes focusing on perfecting your stroke. Once you’re confident you have the technique down then you can start to play with applying pressure to your workouts. If your rowing ratio is correct, you should be able to hear (and feel) a “whoosh” of power as the seat goes back, and almost nothing as it returns easily up the slide. If you’re just getting started on the SkiErg set your damper at 0 and aim to do no more than 5 minutes at first, at a stroke rate somewhere in the upper 30s to low 40s, and build up from there as your fitness improves.